Just coincidentally, yesterday's International Herald Tribune, 25 July 2003, had an article about that petroleum-based halfwit George Bush's new "10-year plan" for dealing with climate change (26.5% of which is fueled by US consumption, mainly of petroleum-based non-renewable energy sources), in which, basically, the US Government calls for further study to determine whether anthropogenic (man-made) causes may be a factor. This comes some years after the definitive Intergovernmental Panel on Climate Change (IPCC)'s Third Assessment Report, issued by a consensus of every single climate scientist who's not on the petroleum payroll, put the basic causes of the impending catastrophe out of doubt, and more than a year after Monsieur Le Boosh commissioned the USA's National Science Foundation to doublecheck those results. And . . . and, when the NSF confirmed the IPCC's findings and then some, Mr Bush dismissed it as a "report from the bureaucracy". According to the incomparable IHT, Le Boosh's new plan asks Congress for US$ 103 million dollars for studies to repeat the IPCC's work in order to see if there may have been any errors. 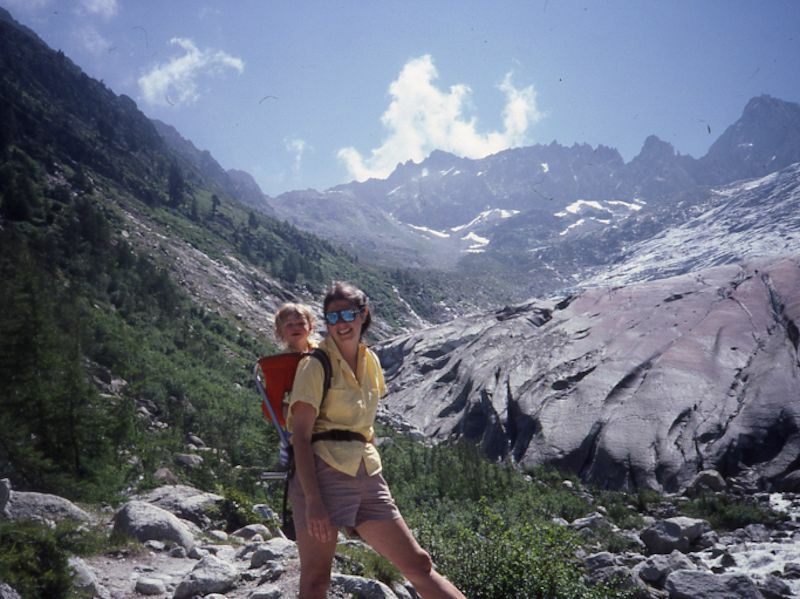 Whenever mountain lovers take a moment to view their favorite glaciers and compare them to just a few years ago, they can get more ornery about US consumers' consumption habits, and their presidential flunky, than a bagful of lynx. 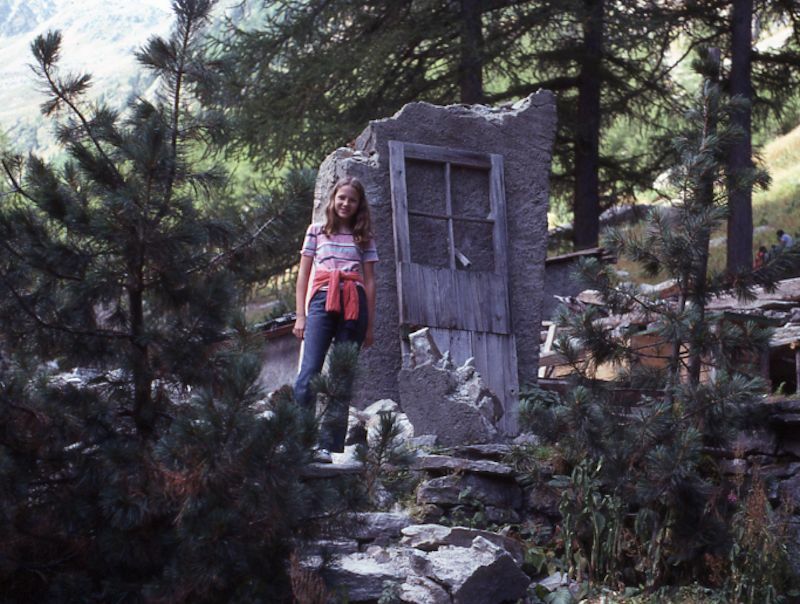 1978: Alison Peck (now an astrophysicist in Chile but then merely a yout') stands next to the hut and buvette at the base of the Trient glacier, demolished by avalanche. A much sturdier structure is there today, and Coca Cola costs only 4 Swiss francs, not bad at current rates. 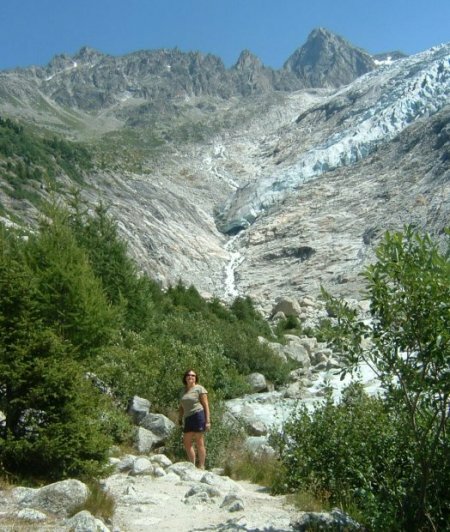 The tongue of the Trient Glacier once lay a bit more than an hour's walk from the Col de la Forclaz (a hotel-restaurant at 1526m on the route between Martigny, Switzerland, and Chamonix, France). 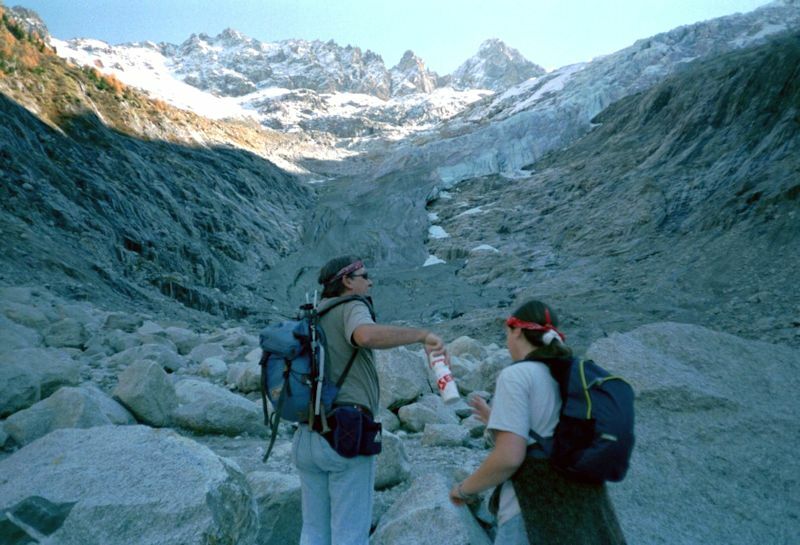 The walk is level along the ancient "bisse", or water channel cut by our forefathers along the steep hillsides to bring water to other parts of the mountain pastures. 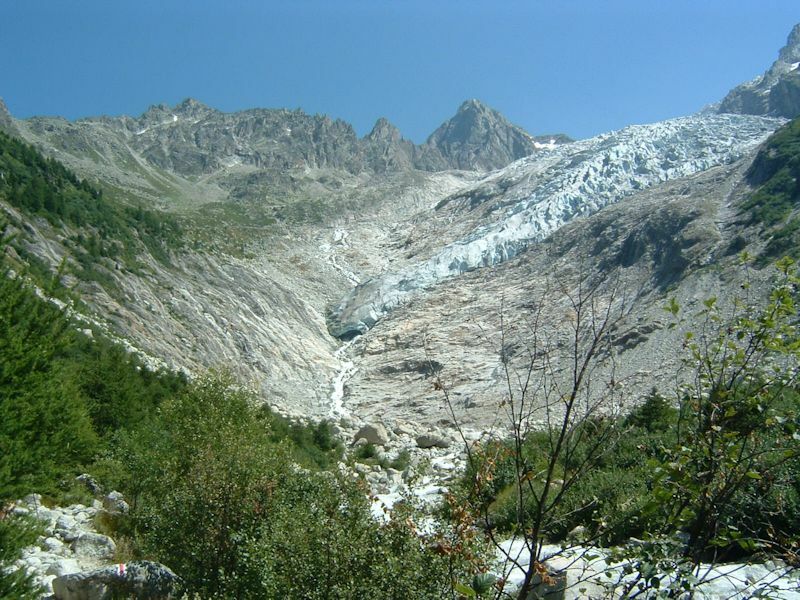 In the late 19th century, the route of the bisse was widened and a small rail track was laid in to bring ice from the tongue of the Trient Glacier to the Col de la Forclaz, there to be transported (wrapped up in sawdust and burlap or something) all the way to Paris, to freshen up the Parisians' sorbets and possibly their martinis. 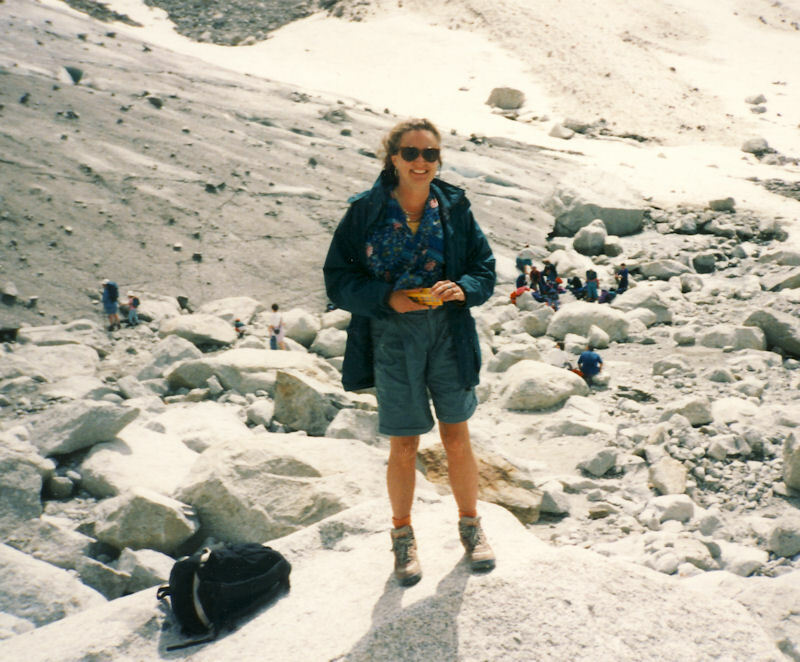 By 1986, an hour's walk brought you to the restored hut and a good view of the tongue of the Trient Glacier. 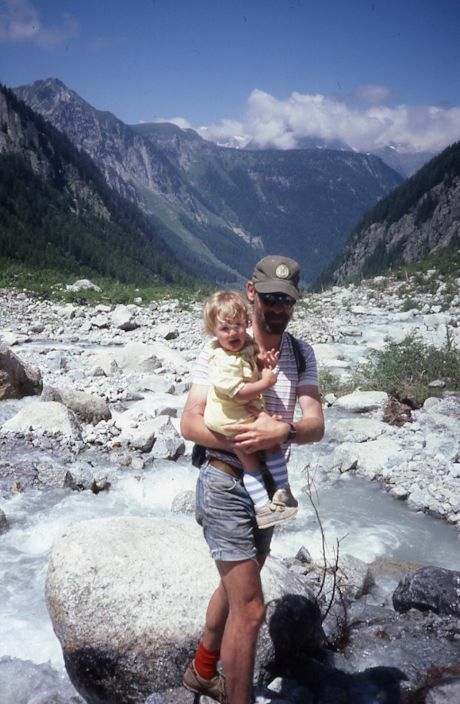 And here it is, viewed by Jane and daughter Marlowe in July 1986: big big tongue, all down into the valley at about 1800m. On the skyline lies the Fenêtre d'Arpette (2665m), over which Jane and Marlowe's Dad hiked in one day a few years earlier. 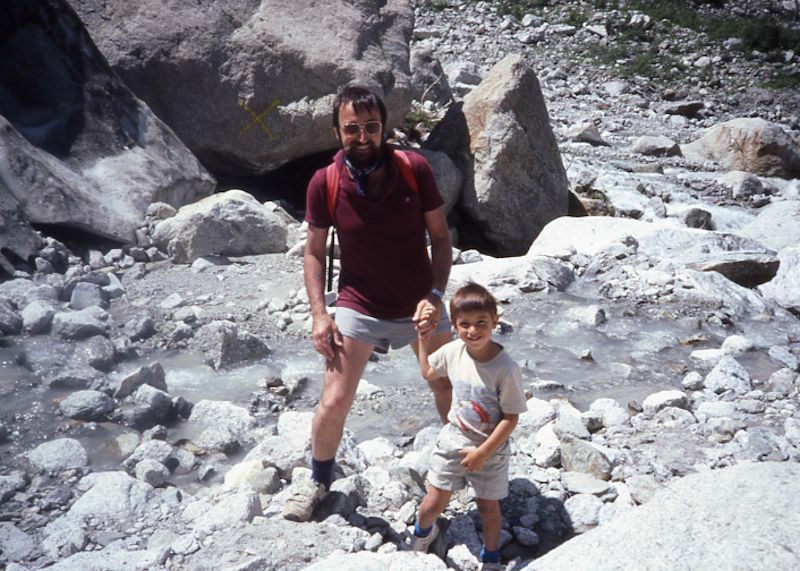 Dr J. J. Pirri holds hands with his tiny son Nareg in the glacier's outflow, 1986. 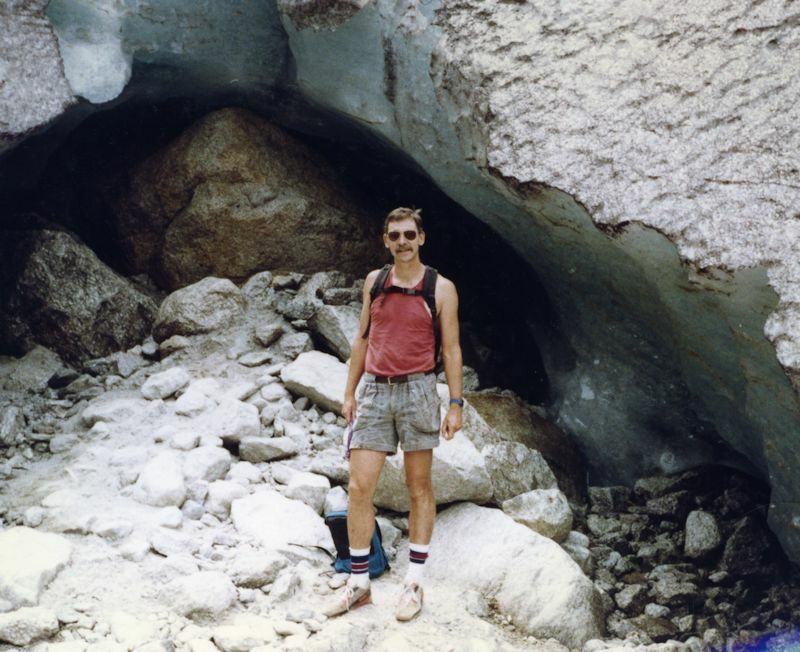 Visiting the Trient Glacier with Michele in 1990, Mr Peck still finds enough ice to pose with, at the outflow point of the glacier tongue, but has to walk a ways farther up the hill to get to it. 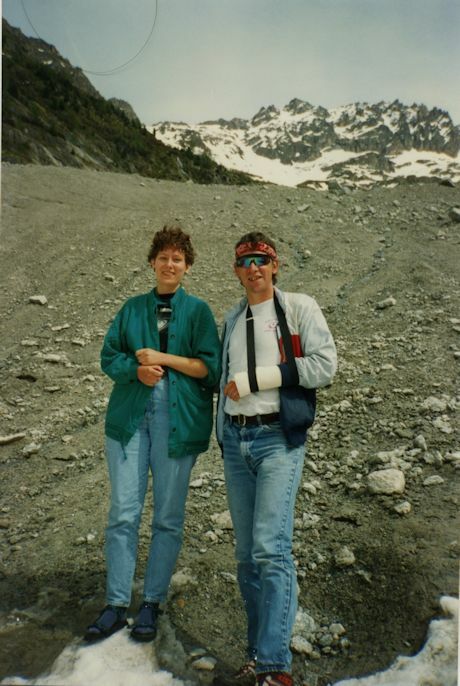 May 1994: Alison and the Old Dad posing in front of the really dirty ice of the glacier tongue, and (right) Lisa, Alison, and Jim Anderson lunching with the icy tongue behind them. 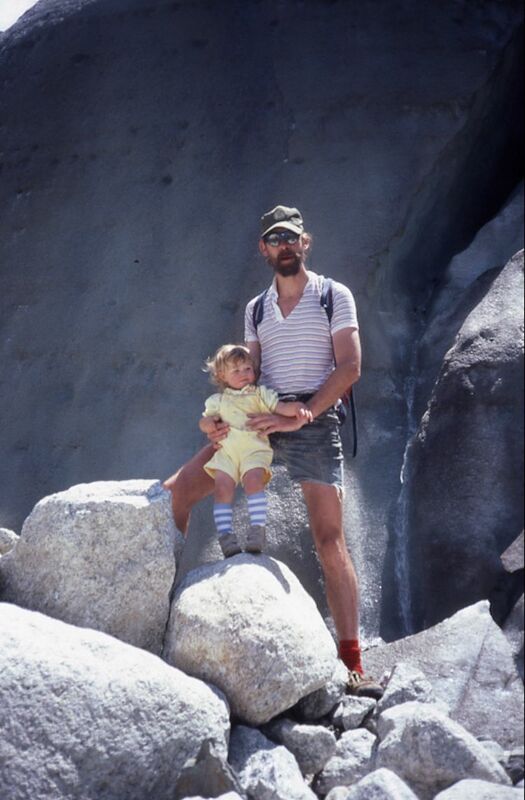 October 1999: Little of its former glory left, the sorry little excuse for a tongue licks down from the Trient Glacier, as Marlowe and the Old Dad gaze at it in dismay. June 2000: Whoops! 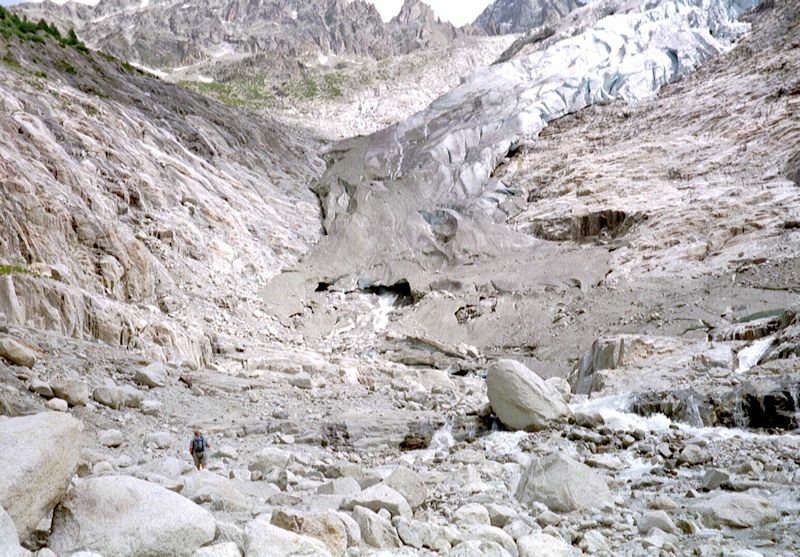 Where'd the glacier go? Little tinky tentacles sneaking down from the plateau of Orny up there at the top. 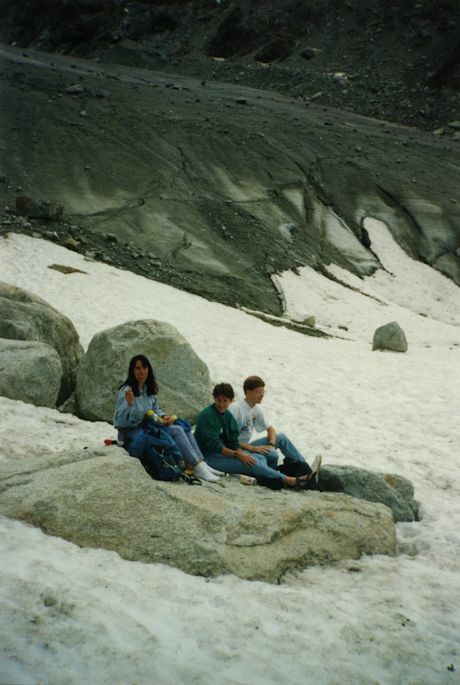 Not too many years ago, ice-climbing students were seen practicing on the steep walls of the glacier right where this photo was taken from. 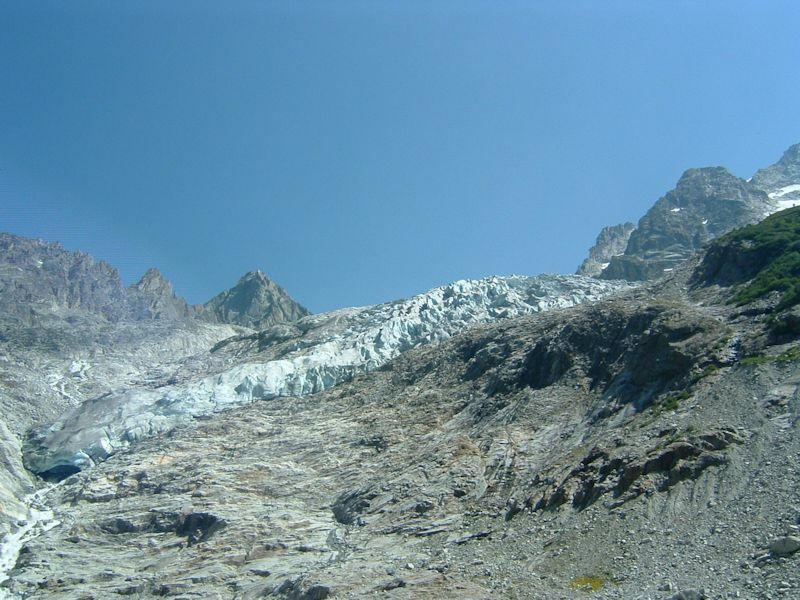 Well, possibly when humans are gone, the glacier will come back again. 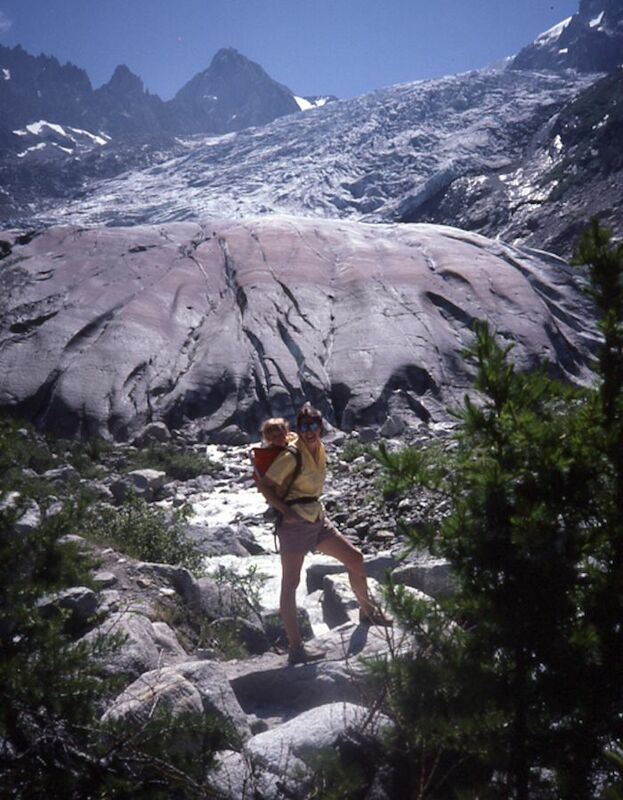 June 2000: A glacier with Chronic Wasting Disease -- all of the rock surrounding that ice was under it no more than five years ago. 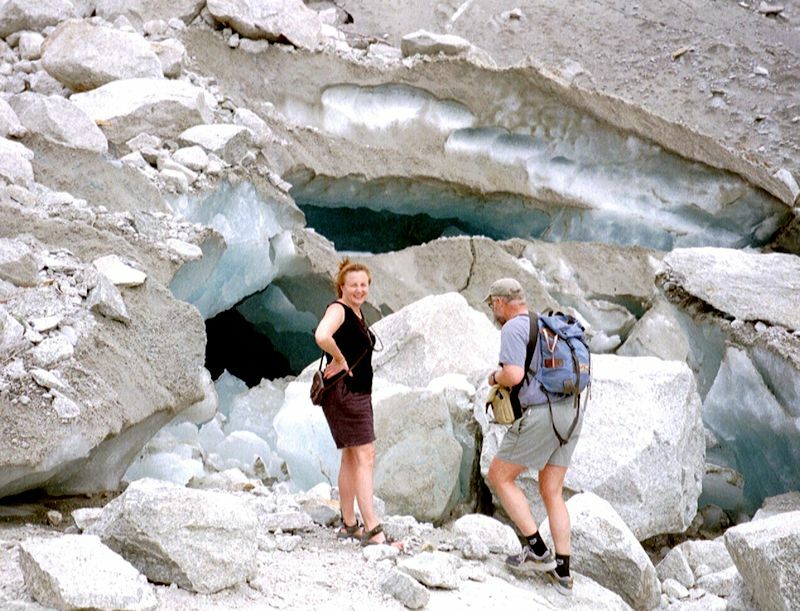 Kristin and Cousin Rob, after considerable scrambling, can still reach the ice on foot, June 2000. 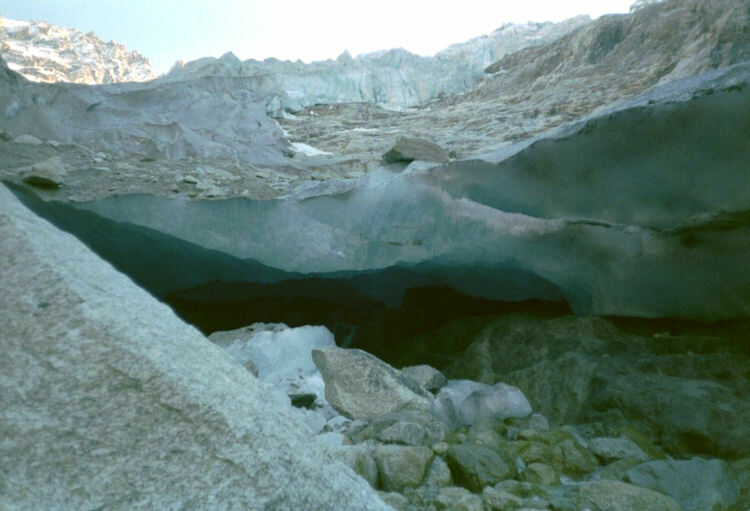 By July 2003, it would be a footrace -- Want to touch the ice? 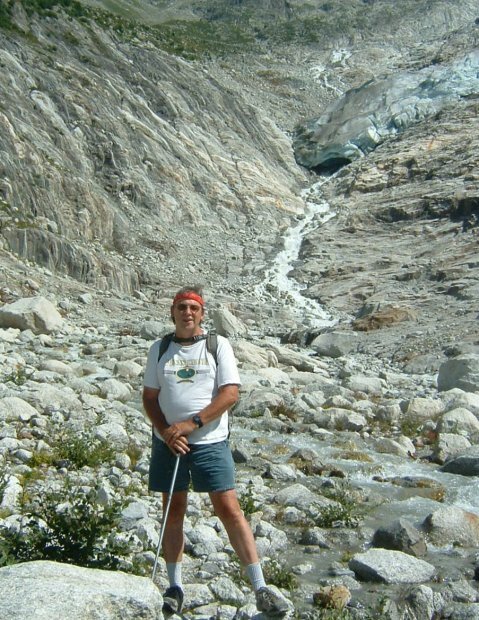 Well, can you run up that rocky hill faster than Mr Bush's ice is receding? 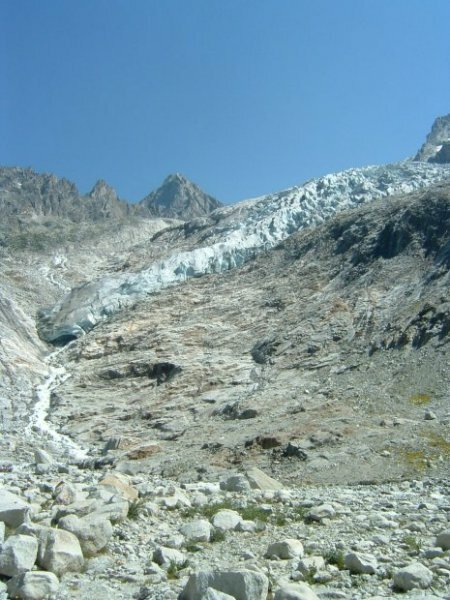 95% of the glaciers in Switzerland are receding at a similar pace, and Monsieur Boosh's Congressmen and Congresswomen who've been put into their privileged places by the petroleum and automobile industries have just produced a 10-year climate change action plan that mainly calls for further study. Aaargh. 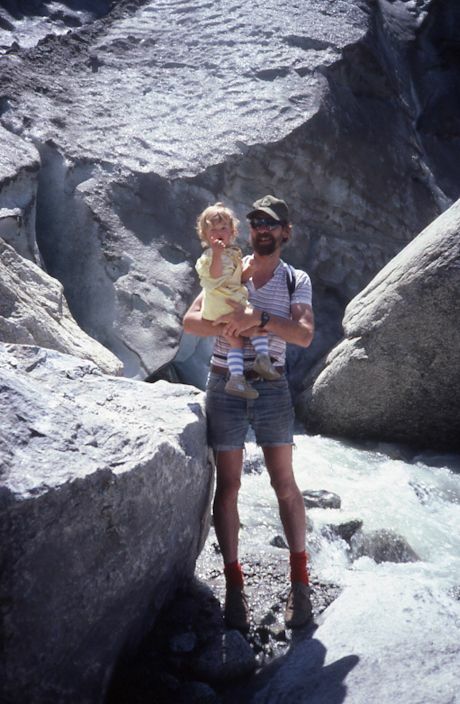 Mr Peck, standing where there was an ice wall 30 meters high not so long ago. 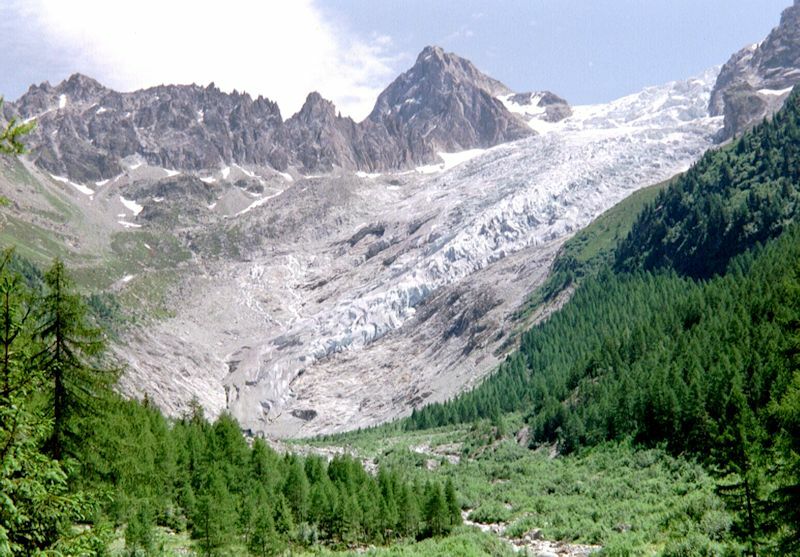 More Trient Glacier, August 2003. With hummus and Lebanese "gourmet" bread. Feedback and suggestions are welcome if positive, resented if negative, . All rights reserved, all wrongs avenged. Posted 26 July 2003, updated 4 January 2011, 11 December 2013.